Story by Trudy Frisk -- Photos by Trudy Frisk and P.W. The old coffee pot stared out at me reproachfully as I opened the door of a seldom-used cupboard. "So", it seemed to say. "this is all that friendship and loyalty mean to you!" It had a point. It was, after all, my first and almost only coffee pot. Oh, there was a brief fling with a large fancy filter pot which a friend bought me when I was hosting a group for a weekend. It was his attempt to move me into modern life. 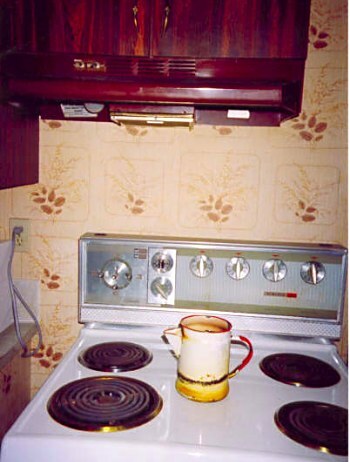 He thought the old coffee pot primitive. Low tech. It has no filters, in fact it has no basket, lid or glass bubble to show the perking coffee. Making coffee in it involves just the pot, some water, the perfect amount of coffee and anything else the coffemeister wants to add. I explained the process to someone who thought for a minute then brightened and exclaimed ; "Of course! Cowboy coffee!" There seem to be two dueling images of coffee drinkers today, the sophisticated urbanite sipping specialty brews, versus the rugged outdoor person warming up for a day on the trail. However different their attitudes and occupations, coffee is important to them both. Why? It's not just about the brew, though you'll get arguments on all sides concerning the type of bean, length of roast, additions to the mix. Writer John Steinbeck listed chicory and egg shells as necessary for bite and clarity. Espresso, latte, double-double? Let's not go there. 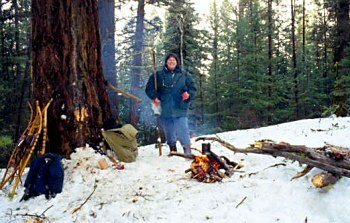 My old coffee pot bubbling on a grill over the campfire would sputter in disbelief. Coffee isn't a necessity, though you'll get a ferocious rebuttal from dedicated drinkers who'd drive miles for a morning cup. (I know; I've been their passenger.) Coffee is about sociability, and companionship. It's also about politics, friendship and public opinion. And, it wakes up the brain cells. That's the conclusion of a European study which shows that "Moderate doses of caffeine- the amount found in two cups-can make people more likely to change their minds when presented with a persuasive argument. That's because caffeine may increase message processing." So say European psychologists and I'll bet they decided that around a coffee table. It seems cowboys washing down morning pancakes with a hearty cup or two before the cattle drive were more likely to agree on who took flank and who searched the sagebrush coulees for strays if they'd sat around the fire sharing coffee. Who knew all that could come from a little green bean? The coffee plant, a small evergreen tree, is native to tropical Africa. It was known and relished in Ethiopia before AD 1000. It had spread to Arabia and from there to Egypt and Turkey by the l5th century. By the mid l7th century it had reached most of Europe. Coffee houses aren't new. Europe was dotted with them. Then as now they were where people went to meet, debate and decide important questions of the day. A shrewd king or politician listened to the talk in the coffee houses. War had a lot to do with the spread of coffee. In 1683 Austria was fighting the Turks. The Turks lost and fled, leaving behind sacks of strange green beans. Legend has it that a spy for the Austrian forces, a trader familiar with Turkish ways, whose knowledge helped the Austrians to victory, when offered a reward replied that all he wanted were those bags of beans. He took them, roasted them and introduced coffee to Vienna. Coffee came with the Europeans to North America as did its rival, tea. Coffee got a big boost after the Boston Tea Party in 1773 when American colonists, outraged by England's tax on tea, threw tea from three ships into Boston harbour. After that a true American drank coffee. Not much has changed. Tea remained the favourite beverage of the Loyalists who came north from the U.S. to Canada. In the Canadian west, because of American influence tea and coffee were enjoyed equally. In many homes coffee was the breakfast drink; it was tea for the rest of the day. If company dropped in, you made them a pot of tea. A friend who spent her childhood in a particularly alkaline part of Saskatchewan remembers neighbours arriving for tea, bringing the water with them, the farm water was that bad. In general, she recalls, farmers drank tea; cowboys drank coffee. Coffee's had its detractors. For years we couldn't open a paper or watch TV without someone in a white lab coat dolefully informing us of the horrid consequences if we persisted in drinking the deadly brew. New studies show it may be good for asthmatics because it relaxes the bronchial tubes. Furthermore, say the people in lab coats, concentrating on the coffee cup distracts the asthmatic. Maybe. Seems to me we shouldn't need medical justification for something so pleasant. Remember lying in bed as a child sniffing the aroma of freshly made coffee? And the exhilarating day when you were judged old enough to drink coffee at breakfast? You might not be fully an adult, but you were on the way. Coffee drinking is an important ritual in North American life. In these busy times there are fewer and fewer home visits, but coffee groups abound. The originator of one group explains their attraction: "You can visit with ten people who wouldn't be at your house at the same time. It's a place for different people to meet and socialize. There's no time table; when you're ready to go, you just leave. People look out for each other; if a regular doesn't show up they'll inquire about him." In an increasingly individualized world the coffee groups provide happy social occasions for people who don't belong to the same religion or community organization. They're egalitarian and non-denominational; they're totally voluntary and no one's required to raise funds, clean up roadsides or sell tickets. The groups are mostly male, but female groups are increasing. Saying "Let's meet at the Coffee Barn. ", is so much easier than cleaning the house and baking before having friends over. Public opinion is being formed in the coffee groups. Here's where the latest politicians' flubs are analyzed, past times recalled, moral questions addressed. In the long tradition of nomads herding camel trains across lonely deserts, cowboys sheltering from the wind around a campfire or writers in Vienna, coffee groups are places for relaxation and taking time to discuss the questions people through the ages have wondered about. So, what do I say to my long-suffering coffee pot, hidden away from fire and light and good, ground coffee, (medium blend)? That pot has fueled many lively late night discussions, brought cheery warmth to my shivering hands in camp, and filled the house with the pungent smell that calls "Get up! It's a new day; anything could happen!" How can I tell it it's been replaced by a morning drink of peppermint tea? Maybe an honourable retirement ceremony mentioning its long, faithful service. It's the least I can do.